The original owner of this beautifully restored classic has placed it up for sale. The 1968 Pontiac GTO up for auction has gone through a four-star rotisserie restoration by Select Motors . The Mecum Auction has been commissioned to sell this vehicle with the proceeds to benefit St. Judes Children’s Hospital. 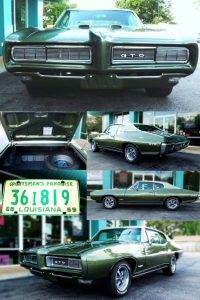 The 68 GTO will be auctioned off at the MECUM Auction in Dallas, Texas in November 2016.